Hiring and interview process in the Indian market is getting more and more technology driven. It is challenging for a candidate to find a perfect job at the same time, it is increasingly difficult for the HR / Recruiter to close a job position especially from middle level to senior and leadership positions. The job fitment needs to be a win-win situation for both the sides. Let us share inside secret with you, today’s recruitment market is CANDIDATE DRIVEN, which means you, are the king, so all the pressure is on the recruiter to keep interview engaging and align candidates interest and experience to the role instead of another way round. Understanding this unlaying fact can help you reduce your stress. However, having said that, there is still anxiety attracted to any kind of screening. According to the study, 43% of job seekers say video interviews are more stressful than in-person interviews. Today, more and more companies are driving towards adopting technology in their recruitment as it improves the efficiency and efficacy of the recruitment process with an automated assessment. However, we understand as a candidate video Interviews can be nerve-wracking as there are factors involved that are beyond your control. So you just pray your internet, your headphone, your dog and even your neighbours cooperate just for these few crucial minutes. During online interactions, there are more possibilities of miscommunications, so one needs to extra observant about the body language and tone during the interview session. To guide your stress and tune it to confidence, we as a recruiter, present you another side of the story that will help you prepare well and understand on what parameters the HR is screening you. Finally, the flexibility of video screening and interviewing gives candidates who are currently working the ability to discreetly interview with a position at their convenience, allowing better chance to close the position on time. 1.Basics – 23% of HR suggest blue color as their prefered interview color. So, like the in-person interview, dress professionally formal shirt, preferably in the solid shade is recommended. Chunky jewellery or messy hair can give a non-serious impression and should be avoided. Then, another basic element is deciding on the space. To need to set up space, where you can sit with minimum disturbances. Natural light works great; however, you need to ensure the light is not coming from your back, it will blind your interviewer or will make you look darker. The lighting needs to be comfortable for both sides. It should not be using strong exposure or overshadows. ​3. Once you have sorted these basics – Now you need to do your homework, like a real personal interview, you can study the employee website, it’s social pages, the job requirement and how you fit as good resource for them. Prepare a plan what points you want to present and what sequence you intend the conversation to go about. Now, fully equipped, it’s time to do a trial run. Hop-in your friend or adviser with whom you can practice mock interviews. The basic question set remains the same as your introduction, your career ambitions, your understanding on required programs or tools. 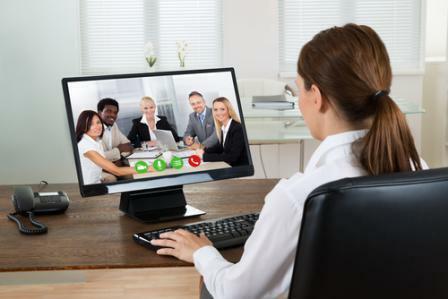 A mock interview will give you hands-on experience of the software you will use for the real interview like skype, google hangouts, GoToMeetings. It will immensely boost your confidence. If you don’t have anyone to practice, you can record your own interview with common anticipated questions and re-watch and re-practice till you feel satisfied. You can also keep your resume on the desk for reference. We, as recruiters really appreciate candidates who show excitement and positivity during the complete interview process. Like you the interviewer is also under pressure to keep the interview engaging and pass the right brand image across. So, you try to listen as much as possible. Keep a notepad and pen handy, just in case, you require to write anything. Try your answers to be crisp, avoid long story response. Be super-focussed as your screen presence is only what an employer can see. Finally, understand the purpose of the video interview, it is a respect for each other’s time. The employer/interviewer is considerate, to share their thoughts first on requirement then if you, as a candidate is interested, they both can take it forward. It is in your good way, the employer is trying to create a competitive hiring advantage, so remain confident and with these tips, your chances of selections are increased. Last, you may ask - What questions can I pose at the end of interview or post interview ? 46% companies, unfortunately, do not share the time involved in the hiring process, so, you can ask the expected time, the whole process may take. Also, you can ask about the preferred follow-up process. Can you call them directly, would they be available over the emails. Still, feeling hesitant? Feel free to comment or reach out.